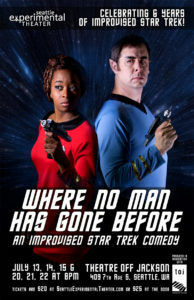 Tickets are NOW ON SALE for the return of Where No Man Has Gone Before to Theatre Off Jackson July 13 – 22. Click here to buy advance tickets (Brown Paper Tickets) and save $4 off door prices! 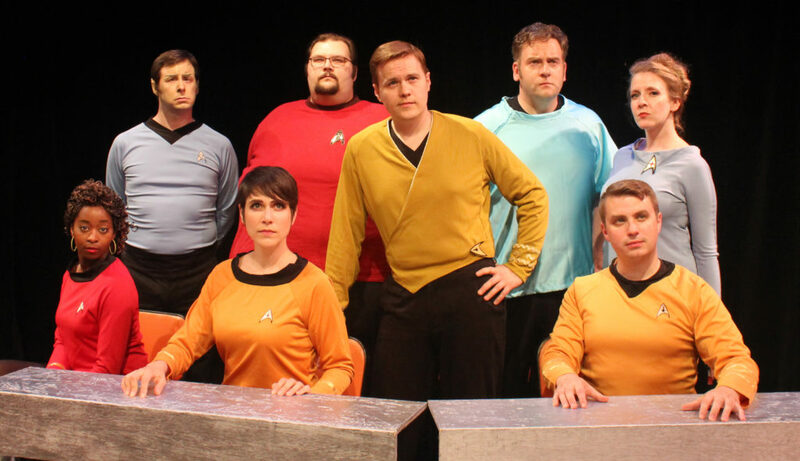 Where No Man Has Gone Before – Seattle Experimental Theater’s hit improvised parody of the original Star Trek TV series – is returning to Theatre Off Jackson in July 2017 for a two week run! Join the crew of the enterprise as they encounter a mysterious ship in space and beam aboard its crew (defined by audience suggestion). But are the alien visitors friend or foe? Tensions rise on the Enterprise as the crew and ship are put in unforeseen danger. At every performance, the cast will use suggestions from the audience to create a brand new episode. Each performance is a completely original adventure. Produced by Seattle Experimental Theater, in association with Theatre Off Jackson. 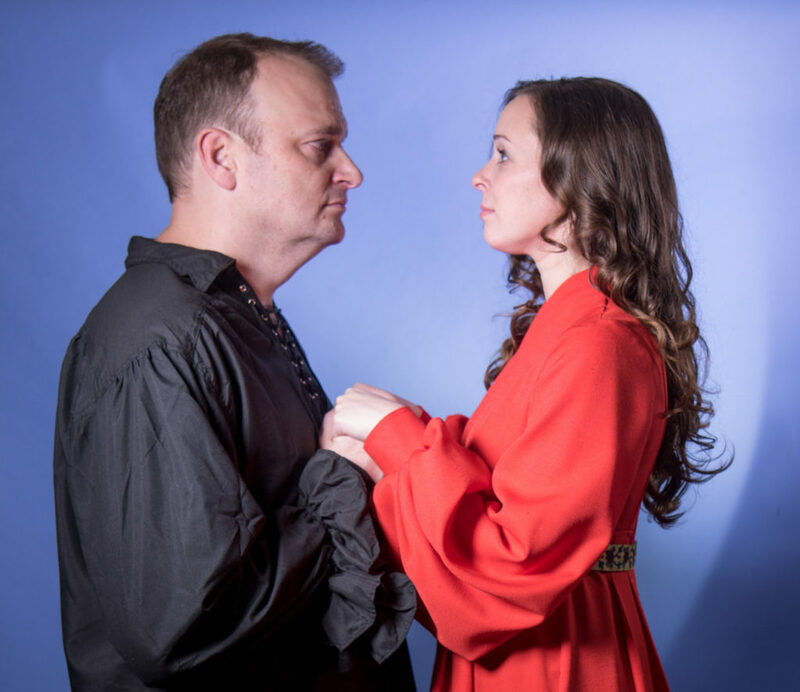 Where No Man Has Gone Before has played at various Seattle venues, receiving popular and critical acclaim. It has been featured in the Hawaii Improvaganza Festival (2012), The Seattle Festival of Improv Theater (2012, 2014), Geek Girl Con, and at Emerald City Comiccon (2013, 2014, 2015 and 2017). As seen on King 5’s Evening Magazine in 2016. Where No Man Has Gone Before is directed by Jeannine Clarke. The cast of Where No Man Has Gone Before is Tony Beeman, Colin Madison, Cheryl Platz, Wayne Pishue, Jekeva Phillips, Nicholas Schell, Sarah Scheller and Douglas Willott. July 2017: Where No Man… Returns to TOJ! Posted on April 14, 2017 | Comments Off on July 2017: Where No Man… Returns to TOJ! Where No Man Has Gone Before: our hit improvised space parody RETURNS to Theatre Off Jackson for 6 performances in July 2017! Tickets $20 online, $25 at the door. 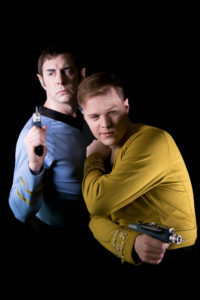 Where No Man Has Gone Before, Seattle Experimental Theater’s hit improvised parody of the original Star Trek TV series, is returning to Theatre Off Jackson in July for a two week run. Join the crew of the Enterprise as they encounter a mysterious ship in space and beam aboard its crew (defined by audience suggestions). But are the alien visitors friend or foe? Tensions rise on the Enterprise as the crew and ship are put in unforeseen danger. Where No Man Has Gone Before premiered in 2011 and has since appeared before packed houses in a wide variety of Seattle venues, receiving popular and critical acclaim. The production has been featured in the Hawaii Improvaganza Festival (2012), Seattle Festival of Improv Theater, Geek Girl Con, and at Emerald City Comicon (2013, 2014, 2015 and 2017). Directed by Jeannine Clarke. Produced by Jeannine Clarke and Samantha Hecker. Featuring (alphabetical order): Tony Beeman, Colin Madison, Cheryl Platz, Wayne Pishue, Jekeva Phillips, Nicholas Schell, Sarah Scheller and Douglas Willott. Technical improvisation by Oliver Trimble. Comments Off on July 2017: Where No Man… Returns to TOJ! SET is delighted to announce that Where No Man Has Gone Before, our hit improvised parody of the original Star Trek series, is returning to Redmond as part of the April Fools Improv Festival at SecondStory Repertory. Join us for ONE NIGHT ONLY on Friday April 14 at 8PM. Tickets $15 – available via Brown Paper Tickets or at the box office one hour prior to showtime.